It’s said there are really only two seasons in Vail: Ski season and construction season. With one winding down — although extended by a week due to great snow conditions — the other one is waiting just in the wings. For a full construction season update, town of Vail officials will hold a briefing Wednesday, April 6 (more on that later). In the meantime, we’ve got quite a bit of skiing left after Vail Resorts extended the season until closing day on Sunday, April 17. Beaver Creek, however, is sticking to its guns and shutting down the lifts on Sunday, April 10. The Beav’ could be closing on yet another spring powder day like the ones we’ve enjoyed last few weeks in the Vail Valley. According to forecasters, another storm is heading into the valley on Tuesday and then yet another system is stacked up and taking aim at Colorado for the weekend. “Monday will be mostly dry, then we’ll see snow from Monday night through Tuesday evening with the most snow accumulating in the northern mountains (3-6 inches),” Opensnow.com meteorologist Joel Gratz wrote on Monday morning. The Vail Golf Course Clubhouse remodel. This past weekend saw plenty of soft snow from a mid-week storm holding up in the north-facing trees well into Saturday. The Taste of Vail and Pink Vail crowds enjoyed excellent snow conditions and sunny skies Saturday and Sunday. An overview of spring construction projects in Vail will be presented during the town’s annual construction season kick-off meeting from 8:30 to 11:30 a.m. Wednesday, April 6 at Donovan Pavilion, 1600 S. Frontage Rd. Contractors, architects, merchants, residents and others with an interest in the upcoming construction projects are encouraged to attend. Several major public and private construction projects will be taking place this spring with impacts to the Cascade, Interstate 70 and frontage road areas, in particular. Project schedules, construction staging parameters, noise allowances and contractor parking information will be discussed by representatives from the Public Works and Fire departments at the meeting. Also, details on the town’s new electronic plan review software, contractor’s registration requirements, inspection schedules, recycling requirements and the latest progress on the Restore the Gore program, stream tract restrictions and best management practices will be available as well as other information and announcements from the town’s Community Development Department. Major construction begins April 4 when temporary median detours will be used to divert traffic to a head-to-head configuration on the eastbound side of I-70 while the westbound I-70 underpass bridge is built. Once the new westbound I-70 bridge is built, traffic will be switched over to the westbound side of I-70 while the eastbound I-70 bridge is built. The bridges are scheduled to be completed in July, at which time I-70 will reopen to two lanes of traffic in each direction and the frontage roads will be detoured to function as one-way travel only; North Frontage Road will be westbound traffic only at the project site, and the South Frontage Road will be eastbound traffic only at the project site. This traffic flow will be in place until the end of November at which time the frontage roads will return to two-way traffic for the winter. The project is scheduled for completion by December 2017. For updated project information, visit www.codot.gov/projects/i70vailunderpass, or call the project hotline at 970-685-7706. CDOT has contracted with SEMA Construction for improvements to the chain station in East Vail. The project is scheduled to begin in early April after Vail Mountain closes and will be completed prior to the 2016-2017 ski season. Construction includes expanding the eastbound chain station 1,500 feet to the west, construction of a retaining wall between the interstate and frontage road, upgraded lighting and water quality. The eastbound I-70 outside shoulder will be reduced to two feet from 10 feet on WB I-70 through the chain station expansion. After May, the existing chain up station may be closed until September. Traffic on the frontage road will be narrowed and shifted with reduced shoulder widths. There will be a bike detour in place during construction that routes around the project using the Eagle Valley Trail, Vail Valley Drive and Sunburst Drive. Town of Vail contact is Chad Salli, 970-479-2169. Vail Cascade Resort and Spa Remodel, 1300 Westhaven Dr. This $35 million renovation is scheduled to begin this spring with completion in December 2016. The project includes upgrades to guest rooms, lounge and bar area, new spa and more. The Aria Athletic Club and Spa and Vail Cascade Condominiums will remain open throughout the construction. Town of Vail contact is Chris Neubecker, 970-479-2148. United Companies has been awarded the contract for the utility infrastructure at the site. Work includes installation of storm sewer, water and sewer mains and conduits for electric/phone/TV on the site and storm sewer upgrades at the north West Vail roundabout. Work in the roundabout is scheduled to occur at night due to traffic volumes and safety. Work adjacent to the roundabout will occur during the day. Work is scheduled to start early April 2016, pending weather and site conditions, with a mid-June completion date. Town of Vail contact is Chad Salli, 970-479-2169. Lion’s Ridge Apartment Homes Construction, 1265 N. Frontage Road W.
Completion of the project is currently scheduled for the end of May or early June. This project involves the demolition of 102 two-bedroom units and the construction of 112 new one- and two-bedroom units. Town of Vail contact is George Ruther, 970-479-2145. Replacement of the bridge deck on the west Kinnickinnick Road bridge over Gore Creek will occur fall of 2016. Work includes removal of the existing bridge deck, installation of a new bridge deck with new bridge rails and approach rails. The bridge will be closed during the duration of the work. Town of Vail contact is Chad Salli, 970-479-2169. Construction is anticipated in late May. The work involves a complete redevelopment of the existing park and includes new hard-surface tennis courts, picnic pavilion, restroom and children’s playground. The park is anticipated to be completed in October 2016. Town of Vail contact is Todd Oppenheimer, 970-479-2161. Fire Station 1 Remodel, 4116 Columbine Dr. This project will increase the size of the apparatus bay to improve functionality and safety. It will also include space for firefighting equipment storage. The project will add one employee housing unit, while eliminating resident firefighter dormitories which have been moved to the West Vail Fire Station. The finished project will also showcase landscaping which meets scenic screening objectives while providing for sufficient fire defensible space. Start date to be determined pending approvals. Town of Vail contact is Chief Mark Novak, 970-477-3474 or John King, 970-479-2170. Golden Peak Pickleball Courts, 461 Vail Valley Dr.
Construction is anticipated to begin in May and be completed in July. The work includes replacement of the existing tennis courts with six pickleball courts and construction of a unisex public restroom, drinking fountain, parking and landscape improvements. Town of Vail contact is Todd Oppenheimer, 970-479-2161. On the south side of Ford Park, the bridge across from Vail Valley Drive will be closed for repairs. Work is currently scheduled to start on May 1 with completion scheduled for mid-June. The Nature Center path will remain open and access to Ford Park will be accessible via Manor Vail or the South Frontage Road. Town of Vail contact is John King, 970-479-2170. 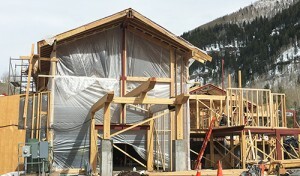 A remodel of the Vail Village Transportation Center terminal is scheduled to begin April 11. Work includes new floor tile, benches and painting. Completion of the project is scheduled for late May 2016. Town of Vail Contact is John King, 970-479-2170. Vail Valley Medical Center Phase 1: West Wing, 181 West Meadow Dr. This project consists of a new fourth floor and expansions on the south and west sides. All construction vehicle access will enter and exit on Vail Road/West Meadow Drive. All hospital services will remain open and fully functional throughout the construction. To access the Emergency Department, use West Meadow Drive. All other patients and visitors should access the hospital via South Frontage Road West. Phase I is scheduled to be completed in 2017. Town of Vail contact is Leonard Sandoval, 970-390-4677. Gorsuch Building, Commissary Restaurant, 263 Gore Creek Dr. This project is for a full-service restaurant in the prior Ore House location and includes interior and exterior improvements. The estimated completion date is mid-June 2016. Town of Vail contact is Leonard Sandoval, 970-390-4677. Landscaping is scheduled for spring as part of project’s completion. Remodel consists of exterior and interior work to the fifth floor and roof. Town of Vail contact is Leonard Sandoval, 970-390-4677. Hotel-Gasthof Gramshammer/Pepi’s Bar, 231 Gore Creek Dr.
An addition to Pepi’s Bar is proposed to increase the size of the bar and modify east entry to the bar. Town of Vail contact is Matt Panfil, 970-477-3459. Vail Golf & Nordic Clubhouse Renovation, 1775 Sunburst Dr.
Landscaping to restore the golf course is scheduled for the spring as soon as snow has melted. The overall project includes significant improvements to the clubhouse, new utilities, drainage, parking lot improvements and the installation of temporary structures to allow for golf and Nordic operations during construction. As part of the renovation, all existing uses of the building, such as the pro shop, Nordic center, restaurant and cart storage will receive significant improvements. The project also includes a modest expansion to accommodate community uses. Completion of project is currently scheduled for September 2016. Town of Vail contact is Leonard Sandoval, 970-390-4677. Improvements include new stucco and paint, new windows, exterior and interior pool improvements, and new locker rooms. Contractor is R.A. Nelson & Associates, Justin Pronga, 970-949-5152, Construction is anticipated to begin April 11 and complete by mid-November. Town of Vail contact is Leonard Sandoval, 970-390-4677. Work to repair 17 decks with water proofing issues and other miscellaneous maintenance is scheduled to start on April 11. Impacted areas within the Lionshead Mall will be the Montaneros alley, the north end near Sunbird Park, the east end of the Arrabelle as well as the Arrabelle Plaza. Pedestrian access will be maintained at all times. Pedestrian and traffic control personnel will be provided. Completion is scheduled for mid-June. Vail Resorts contact is Matt Lydens, 970-331-7755. Completion of the project is scheduled during the 2016-2017 winter season. Impacts include various periodic single lane closures along the South Frontage Road and West Lionshead Circle throughout the duration of the project. Town of Vail contact is Leonard Sandoval, 970-479-2198. Work is scheduled to resume in late April, with a completion date of early June 2016. Town of Vail contact is Todd Oppenheimer, 970-479-2161. Repairs to the north wingwalls and approach to the Forest Road bridge will occur during fall 2016. Work includes excavating and removing the existing wingwalls, pouring new wingwalls, drainage improvements and bridge rail repairs. The bridge will be closed during the duration of the project. Town of Vail contact is Chad Salli, 970-479-2169. The town has contracted with Elam Construction for asphalt milling and overlay on Chamonix Lane, Buffehr Creek Road and the western portion of Lionsridge Loop. Work is anticipated to take approximately two weeks and completed by mid-June 2016. Town of Vail contact is Chad Salli, 970-479-2169. Slurry seal surface treatment will occur on residential streets in the Matterhorn, Glen Lyon and Booth Creek Neighborhoods. Slurry seal creates a new wearing surface and seals the asphalt to prevent the damaging effects of water intrusion into the pavement and oxidation from the sun. Single lane closures will be in place while the slurry seal is placed and traffic will be allowed back on the surface once the product dries, typically three hours. Work is anticipated to take approximately three weeks and completed by end of June 2016. Town of Vail contact is Chad Salli, 970-479-2169. 2016 work includes bridge rehabilitation and deck repairs on the westbound bridge. The median crossover will be used and one direction of I-70 will be closed, similar to last year’s work. The project will start again in early April in a crossover configuration which will extend until mid-June. Final project completion will be shortly thereafter once crossovers are removed. Town of Vail contact is Chad Salli, 970-479-2169. Construction includes replacement of substandard bridge rail and concrete barrier on I-70 from milepost 180 to 186 on eastbound and westbound. Construction is scheduled to begin in May, weather dependent, and be completed in 2017 with no work occurring between approximately October 2016 and end of April 2017Traffic Impacts during the bridge rail work include narrowing and shifting the through-lanes and single lane closures for the concrete barrier replacement. The maximum length of lane closures will be two miles to further minimize delays in each direction. Two lanes will be open from Friday at 7 a.m. until Monday at 7 a.m. The project will have some night work. CDOT contact is Mike Voxakis, Michael.voxakis@state.co.us.